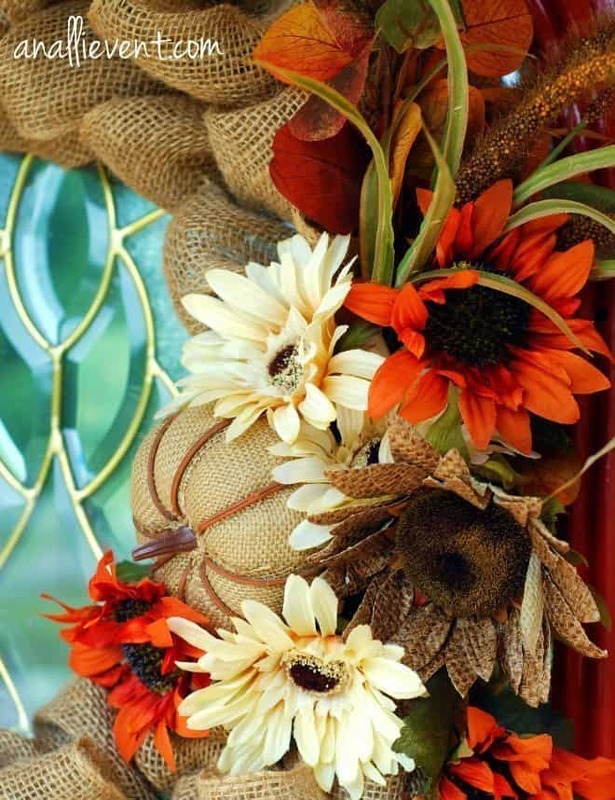 I know that fall burlap wreaths have been all the rage for several years and yet I’m just now jumping on the bandwagon. I never really wanted one until I saw Denyse’s at Glitter, Glue and Paint. You can find it here, including a list of supplies that you will need. I really like it, so I used it as my inspiration. After seeing Denyse’s fall burlap wreath, I needed to make a trip to Hobby Lobby, except it was not on my way to the restaurant supply warehouse in Charlotte – it was on the other side of town – so I decided to drop by Michael’s, except they had closed the location I would be driving near, so I stopped at a JoAnn’s Fabric and they didn’t have what I needed. So the next day I headed to Hobby Lobby in Florence. Gosh. All that to get supplies for a wreath. Also, in the last picture, the one of the wreath hanging on my front door, it looks like the burlap is darker at the top of the wreath than at the bottom (or am I the only one noticing this?). It’s the way the sun is shining on the door and I didn’t want to wait to take another pic. It’s all good! Using my old work table made it much easier! First off, I don’t like to have to tie things on and that sort of thing, so I made my wreath without using hot glue, florist wire or anything. And I’ve tested it on my door for over a week before writing this post and nothing has dislodged. It still looks the same as the day I made it. And, believe me, the grands have been in and out over the last few days so the front door has been slammed numerous times. 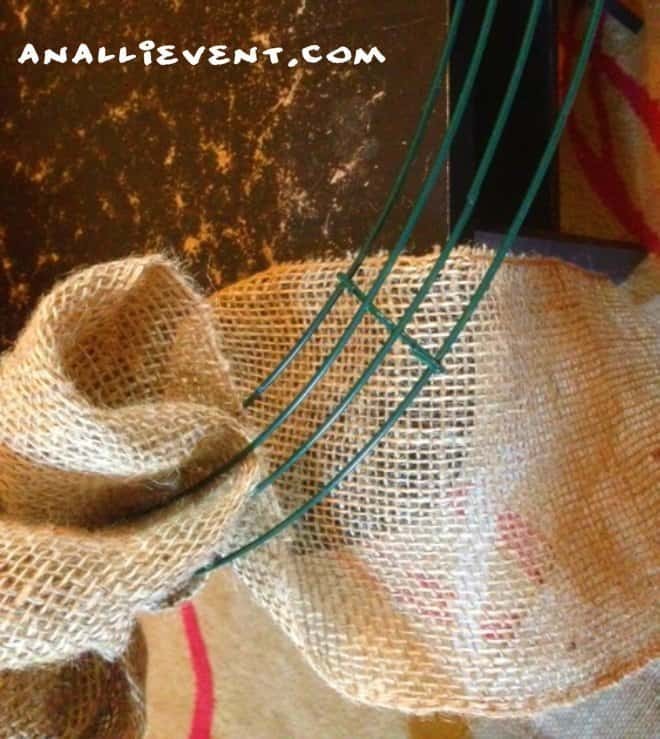 I started from the back of the wire wreath and just took turns pushing the roll of burlap up between the three wires, fluffing it and going in between the next wire, making sure I went between each of the three wires each time. I kept pushing the loops close together so the frame of the wreath wouldn’t show. I kept checking the wreath to make sure I was making the same size loops. I noticed I had a tendency to get bigger and bigger with the loops, so I did have to adjust a few of them. At the end, I left an area covered with burlap, but with smaller loops, because that is where I wanted to stick my flowers, pumpkin and grasses. And, that’s it. I have a clear command hook that I leave at the top of the glass on my front door to hang wreaths. I bet it didn’t take over 20 minutes from start to finish. I should have timed it. I did make a fall ribbon, but I thought it looked weird with all the fluff of the burlap going on. So I didn’t attach it. Your wreath is GORGEOUS! Definitely worth driving all the way to Hobby Lobby to secure your supplies! Thanks so much! I really need to go check out your cloth napkin tutorial. I love them but they are so costly! Alli, your wreath looks beautiful! You did such a beautiful job and it looks just perfect on your door! Thanks for sharing and pinning! Have a happy Monday! This is beautiful, Alli! I haven’t tried a burlap wreath yet, but you’ve inspired me to give it a shot! Thanks for sharing! What a gorgeous wreath! You adorned it so perfectly…..and I hear ya on what you need to do when you “just want to get some fabric”. Hobby Lobby is an hour from me, so I constantly have a “Hobby Lobby Shopping List” going! Hobby Lobby is an hour from me, too! I always have a list on my cell phone! Can’t wait to check out your chicken parm. soup. Sounds heavenly! Crafty Allie recently posted…We NEED your VOTE! Please help! 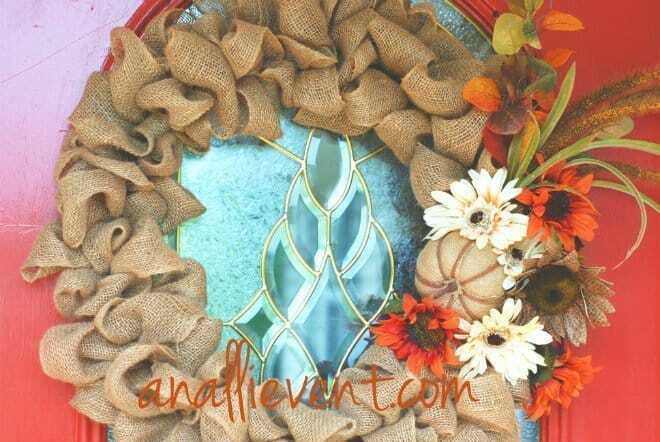 I’ve never used one of those wreath forms or burlap ribbon either, it looks fabulous! Jeannie recently posted…DIY Halloween lights kids can make. Thanks. It was so easy! I’m all about easy! Kimberly Leverett Osburn recently posted…Ten Minute Rolls and Why I am glad the first only “Rolls” around once a month. I used two spools of burlap garland (total of 20 feet) and the 16″ wreath frame. I went to Hobby Lobby for everything except the burlap garland. I bought it at JoAnn’s Fabrics. They had burlap wreaths already made up at Hobby Lobby for almost $100.00 each! They were a little bigger than mine but I didn’t think they were that cute and certainly not $100 cute! I didn’t really add up the cost, but it wasn’t that much at all. I know it wasn’t over $35.00, if that much. Kimberly Leverett Osburn recently posted…Guest Blog: Megan from Crafty Meggy. Halloween Witches Hats and Brooms! Crystal recently posted…Lovely Thursday Link Up! Make sure you post about it when you make it! Would love to see it! Alli!!! I love your wreath and I’m so glad I was able to inspire you. Yours turned out beautifully!!!! Love, Love, Love it!!! 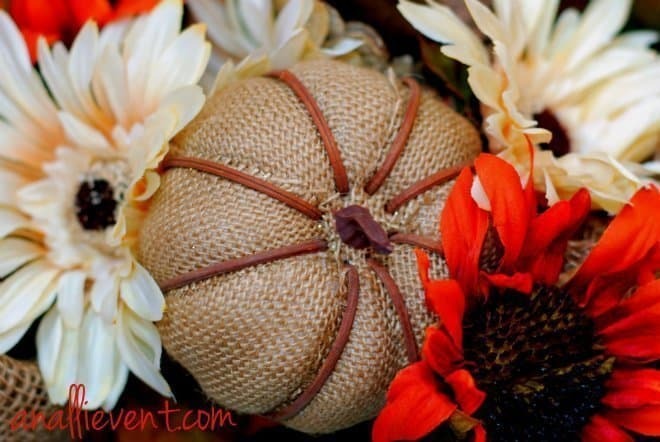 I haven’t liked a lot of the burlap things I’ve seen–but I love this! Great job! Thanks for linking up at Bloggers Brags Weekly Pinterest Party. I pinned your wreath to the Bloggers Brags Pinterest Board and to my personal boards. I haven’t liked a lot of burlap things, either. I guess that is why it took me so long to try it. Thanks for your wonderful linky party! Now that it’s September, go ahead with the fall decor, Felicia!